This podcast is a little break from the recent norm, as I give usual co-hosts Darrell Louder and TC Petty III a tiny break (but they’ll be back!) and bring on some new knuckleheads in a fun and different Q&A format – turned on its quirky nogging. So sit back and enjoy some banter with two of the gaming industry’s nicest guys ever, Matt Riddle and Ben Pinchback. AND DON’T FORGET THE CONTEST! 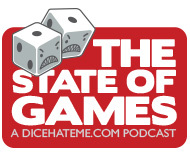 That’s right, dear listeners – toward the beginning of the podcast, there are instructions to enter for a chance to win ANY Dice Hate Me Games title and exclusive expansion. You can choose from Carnival and The Sideshow (all sold out, and only available from DHMG), VivaJava and the Geekspansion, or The Great Heartland Hauling Co. with the 5-player Badlands expansion. And all you have to do is leave a comment on this post! Be sure to do it before 11:59 p.m. on Saturday, April 20 and you could win the game and exclusive expansion of your choice! Love the podcast, and love your catalogue of games! My son really digs Heartland Hauling! Wonderful podcast wich greatly increased my board game wishlist (Fleet was on this wishlist. Now it’s on my board game shelf…!). I already own each of your games (and am looking forward for Compounded…) and enjoy them all. If I win, one of my friends may receive a surprise…! Chris, I really enjoyed your chat with Matt and Ben. Sorry, but I can’t forget “The Emperor’s New Clothes” ever happened. I thought that was a brilliant gag by Jonathan Liu – and a bit of a gamble by Dan Yarrington. Putting his “Springboard” seal on an “overt hoax” like that risked a little goodwill among people still learning what Game Salute and Kickstarter really are. Nevertheless, it was too good a stunt not to pull off. I am so looking forward to Dice Hate Me’s next three games! And I’ve got to get my hands on “Fleet” as well. P.S. Close down the contest, shoot me a copy of “Great Heartland Hauling Company,” and call it done. Love fleet and have shared it with many friends and family, all of whom also love it. Haven’t heard of most of the games discussed, but now I have more games on my wishlist. And a bunch of back-episodes of a new podcast to listen to as well. Keep up the good work! Wow! I almost forgot. Thanks for the reminding tweet. Thanks for teaching me Fleet and thoroughly trouncing me. Great podcast (as usual)! Matt and Ben were great and quite entertaining, they should be semi regular guests or perhaps have their own segment. I recently got Fleet so I look forward to trying it out. I’m sure it will at least be my second favorite game featuring fish produced by Gryphon games! Been dying to try TGHHC. Great podcast! Please enter me in the contest. Thanks for the great podcasts. Missing the voice that is Monkey238… the female perspective on the hobby is something that we do not get enough of, although I can see how atypical her perspective is. Regardless, I like what I get from the podcast and seeing the business side of things is always helpful to me. THANKS! Great episode, thanks for the contest! Do we know who won the contest? My thoughts on the ‘The Emporers New Clothes’ phenomenon is that it being sold as a prototyping kit just seemed like a tacked on or last minute reason to make it appear that it was a legitimate investment when it became clear that a lot of people were taking it seriously. There seemed to be to many notable boardgame personalities who were *in* on the joke for it to have been a promotional stunt just to sell a prototyping kit. Thanks for producing the podcast. It’s always a good listen.